Hi, Summerhill fans – we are currently working on a new pool located in Las Colinas, TX. This home is under construction so excuse the messy job site! We are always eager to show off our work so we are very excited to bring you this in-depth article. Because this pool is under construction we do not have any finished pool pictures just yet. Instead, we have a lot of in-depth information about how this pool is being made. Sounds cool, right? We assure you it surely is and we think you will be surprised by the lengths we need to go to build this pool. As you can see from the pictures below, this is a small backyard. The home and pool are located on a steep incline. This requires special engineering designs to support both the house and the pool. For those of you who may not know, Las Colinas is notorious for ground movement. Anytime a swimming pool is built in this part of town, the soil needs to be tested for potential ground movement. The reason being – we need to take every measure possible to ensure that this pool does not move over time. In order to do that we had to bring in the big guns: the engineers. At Summerhill Pools, we do everything by the book. In order to ensure a perfect pool design, we requested a soil sample by Soil Engineers. These smart soil wizards test the ground to determine the maximum potential for movement. This is a fancy way of saying – its how much they predict the soil will ever move. Once we received our soil results we presented this information to a team of Structural Engineers. 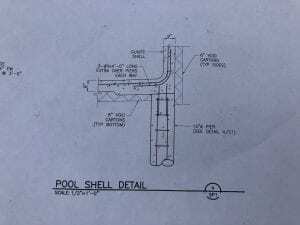 These intelligent professionals drafted our pool design. For it to be built under their tutelage and receive their stamp of approval we needed to follow their design specifications exactly. Building a swimming pool on piers is something that we have done numerous times at Summerhill Pools. In fact, Mark McCaffrey (our beloved owner) is a specialist in the Commercial Swimming Pool realm. 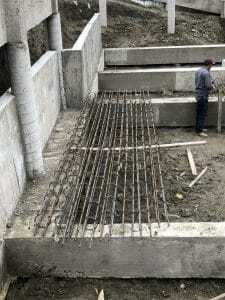 To build a pool in the commercial side of the business you need to have an aptitude for very complex installation techniques. This is due to the size and strict requirements of commercial work. Approaching this pool design, we needed to wait for the home foundation to be completed (check!). Now it’s our turn to get in the backyard to do our thing. First, we lay out the pool size & shape using orange spray paint for our excavator. 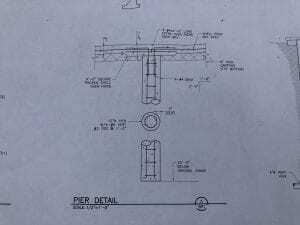 We also notated the pillar placement by orange circles – to show our pier crew where they need to bore each hole. Thirdly, we have a technical aspect of our pool design that we would like to show you. Our structural engineers called for an installation tool known as a Void Carton. It’s okay – we didn’t know what it was when they first told us either. The void carton (as detailed in the image caption) is literally a thick block of cardboard that we place between The Pool Shell and our Concrete Piers. Its sole purpose is to create a barrier: in our case, it leaves of a void of 8″ to 12″. The void carton is designed to be strong enough to hold up during install but will erode away after about 6 to 18 months in the ground. The moisture of the ground erodes it away to leave a gap between the pool shell and the soil beneath it. Our pool will continue to rest on the piers but we have successfully left an intentional 8″ to 12″ of space for the soil to expand and contract beneath our shell. This allows the ground to do its movement thing while our pool rests peacefully above the surface with little to no interruption from expansive soils. Lastly, we wanted to share another preventive measure that we are installing on this pool. Groundwater is a tricky entity of its own. It’s quiet and isn’t something that a home owner typically noticed until its too late. Swimming pools are designed to keep water in (on top) and they are also designed to keep water out (underneath). The irony of a swimming pool is that it also behaves like a boat if too much water gets beneath it. This can cause a shell to literally Pop out of the ground and there is no easy way to put it back in. To prevent this tragic effect, we are installing a permanent Sump Pump System designed to capture and remove groundwater automatically. It’s a neat process and one that we have installed many times. We included this video above to show off the talent of our Superintendent – Dave Jetter. Dave easily explains to us how this groundwater is captured and removed by our sump system. We are grateful to have Dave on our team because he brings knowledge and expertise to the field where they are needed most. Great work Dave! If you enjoyed this article and learned something cool – that’s great! We have lots more articles written to explain our installation techniques and design concepts to you. The purpose being – we feel that our customers gain more trust in our abilities and understanding of our craft if they have limitless information to refer to. For that reason, we make the pledge to always provide you with information to make doing research easier and a lot more fun! We want to be the pool company that you choose when it comes time to buy a pool. For that reason, we show off our work to show you why we at Summerhill Pools are the team to trust with your home investment!